When fans of the Pittsburgh Pirates “root, root, root for the home team,” they’re doing so in one of the most beautiful ballparks in the world. Designed as a tribute to classic ballparks of the past, PNC Park salutes the traditional homes of America’s favorite pastime: Boston’s Fenway Park, Chicago’s Wrigley Field, and Pittsburgh’s long-beloved and bygone Forbes Field. Designed by HOK Sport, the Kansas City–based ‘leading stadium designer in the U.S.,’ the facility sports archways, steel truss work, and light standards that evoke nostalgia for a simpler time. Anything but simple, though, PNC Park was the first two-deck ballpark built in the U.S. since Milwaukee County Stadium opened in 1953. 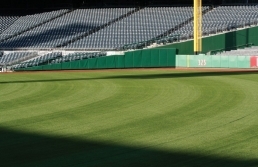 While inspired by the past, its amenities are distinctively modern, including a 24 by 42 foot Sony JumboTron, accompanied by the first-ever LED video boards in an outdoor Major League Baseball stadium and out-of-town scoreboard with details of every game being played around the league. It all adds up to giving Pittsburgh fans a lot to cheer about.